This was the PERFECT dress. It was the first dress I tried on and I knew that it was meant to be! It was so comfortable and lasted through a whole night of dancing! 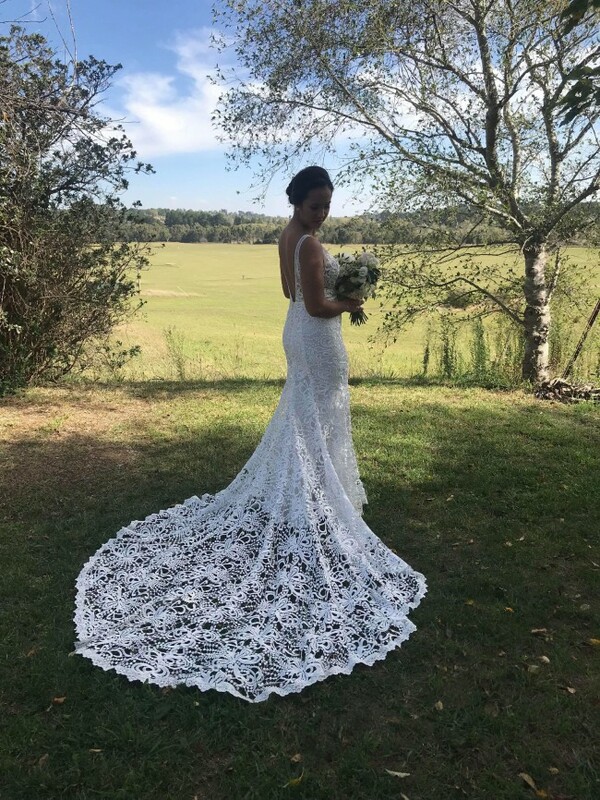 I wore this dress in April 2018 and it has since been dry cleaned by Sydney Wedding Gown Preservation and it is as good as new! Dress also comes with the amazing Chani veil in all of its 3 metre glory! About the dress - from the MWL girls: Dramatically inspired by two of our favourite girls, she’s the perfect cocktail mix of the exquisite Danni and the luxurious Sasha. We all love the figure hugging shape of Danni with her plunging low back and sweetheart neckline and now she has been recreated with the extraordinary lace that we’ve all become obsessed with in Sasha. Her underlay has the option of either being ivory or latte, both with an overall appearance of magic. We are spell bound by her magnetic charm, she is one sure to sweep you away too. About the veil - from the MWL girls: Our Chani Veil is a single layer 3m cathedral length veil made of the softest tulle. Chani is simple and elegant and suits all wedding dresses. Chani comes with a comb so it can easily be placed on your hair. I had my alterations done by Made with Love's recommended seamstress in Sydney. I had the train shortened, the straps shortened and had invisible cups sown in (these are easily removable). She also made some minor alterations to make my booty pop! She also added a ribbon look to tie the train up to make it easier to sit and hit the DF! Once you send a message, Tash can invite you to purchase the dress.